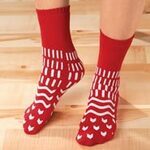 Diabetic slipper socks with gripper soles help reduce pressure on sensitive legs. Wide, non-binding opening stays put. Diabetic slipper socks are 80% cotton/20% nylon. Machine wash. One size fits most. Made in USA.